you have a good team to help push it out of the mud. I wheeled it on a part of the old Fort Belviour engineer training grounds. We were there for a camporee and ended up driving all over the vehicle course. 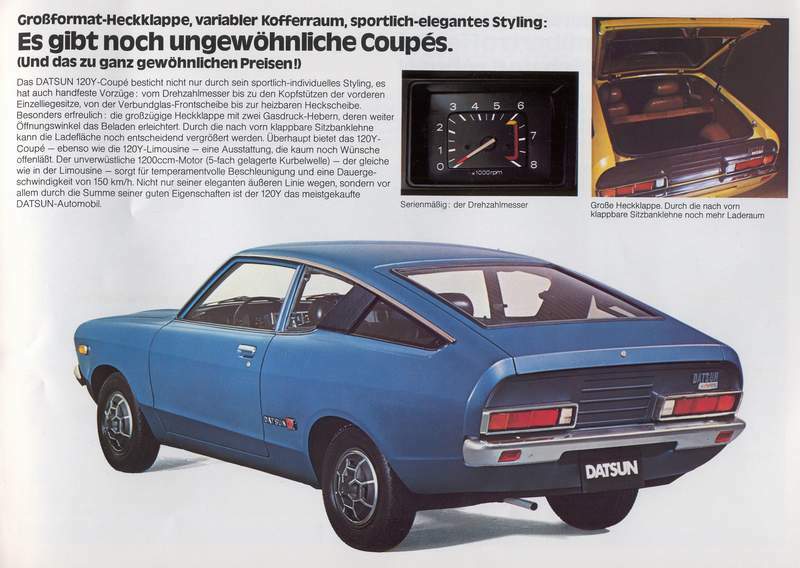 My of f roading started again 3 years later when I drove my 76 Datsun B210 (The Bright Yellow colored hatchback) Not much of an off roader..
but light enough that 2 people could pull it out of stuff. 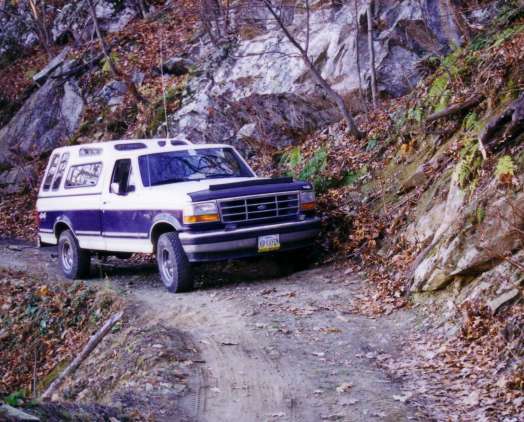 This was my caving car until 1987. In 97 i bought a 2wd Ford ranger pickup. I was stuck only 2 times.. once in mud and the next time in sand at Va. Beach. This was the last straw.. I bought my first 4x4 one year later. It was (of course) a Ford.. F150 4x4 loaded but stick shift and 5.0 V8. a poor purchase. I found a 1980 CJ7 for $3k. It had a 4 inch lift, and a 3 inch body lift, and 33x14.5 Baja Belted tires. It LOOKED cool, ran ok and seemd like a good deal. Later on we found huge body rust, frame rust, cracks, worn out motor, etc. I spend a lot of time and some money on it. 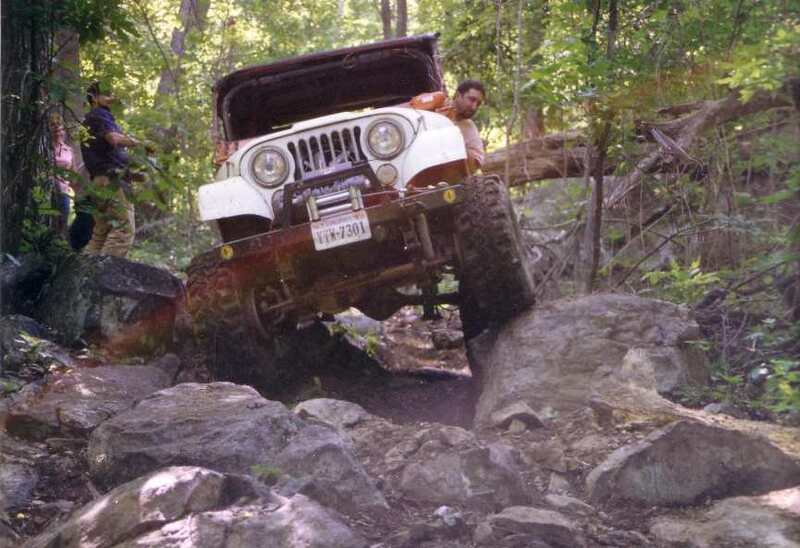 In 1997 I went on the first #Jeep (Efnet Jeepers) Rubicon Run. Here is an excellent Trip report and Photos. 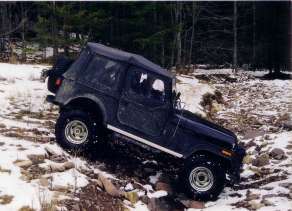 I knew after this that the old CJ would NEVER be able to do this so I found and bought a pristine 1986 CJ7. had a Warn 8274 winch on the nose. 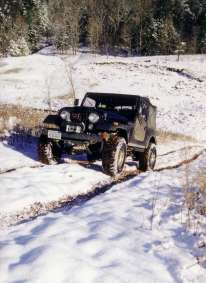 It was a great jeep and I was able to wheel it 4 times before my (now X) wife left me and took the jeep with her. I found a 1974 CJ5 in 1998 and over 6 months rebuilt it with a 2 inch lift, 2 inch body lift, Fuel injected (Holly projection) 304 V8. I bought a T18, and an AtlasII transfer case. but a bad dirt or mudder. The axles (Dana 44 full float rear and Dana 30 front) are locked and geared at 4.22. It had a full roll cage (good thing) and a Warn 9500I with Dual battery setup (Very good thing). ( a rock came in and banged my thigh) then onto the top, then ondo the passenger side. All the while i was turning 45 degrees, then sliding down the hill 20 ft or so. I ended up pointing up hill, on the passenger side (motor still running) with the rear up against a tree. I was able to winch (I had JUST put onthe 9500i and the dual battery setup) it onto its wheels (strap and winch and d rings..) and off to the side of the trail. The gas tank had emptyed, the radaitor had been vented so I was dead where I sat. I was with a TJ that had broken an axle shaft so we were stranded. After 30 mins on the cb our trail guide came back to check on us and we loaded 5 into a cj5 and rode back to camp. I got fuel, water and 2 freinds and we recovered ti the next day with no major problems. I repaired the damage but was no longer comfortable in it. I reversed the backspacing in the rims (widened the axles by 8 inches) and took it back to Big dogs. 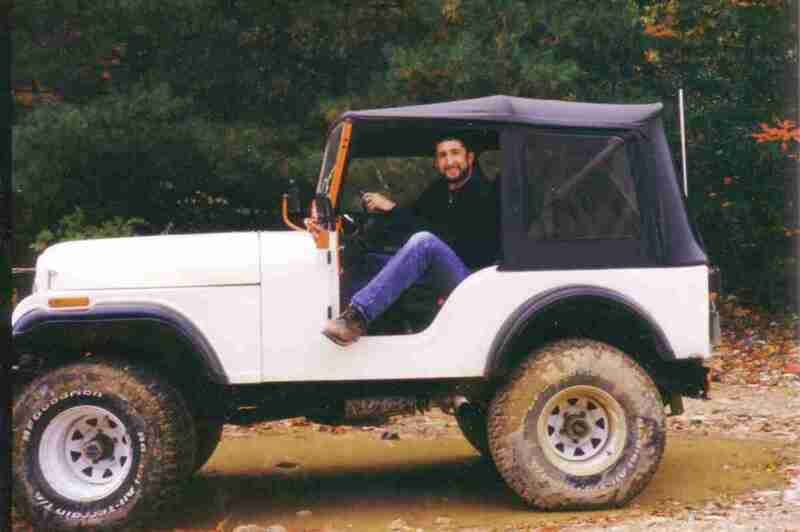 This time I had my best runs in it but I had already bought the CJ7 so the 5's days were numbered. The 5's last run was to Big Dogs 1 year after the roll. The it sat in the lot till I had the money to rebuild the CJ7. It donated its transmission and transfer case to the new CJ7. the 74 CJ. I had started gathering parts for upgrading the 74 but decided to put them into the 86. Here are pics of its last ride. Now it is sitting waiting to be sold. 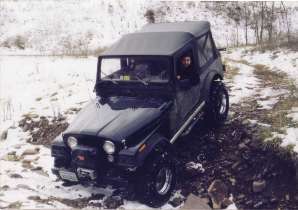 for another year and not start the buildup of the CJ7 untill May 2003. Oh. I Do have other toys.. 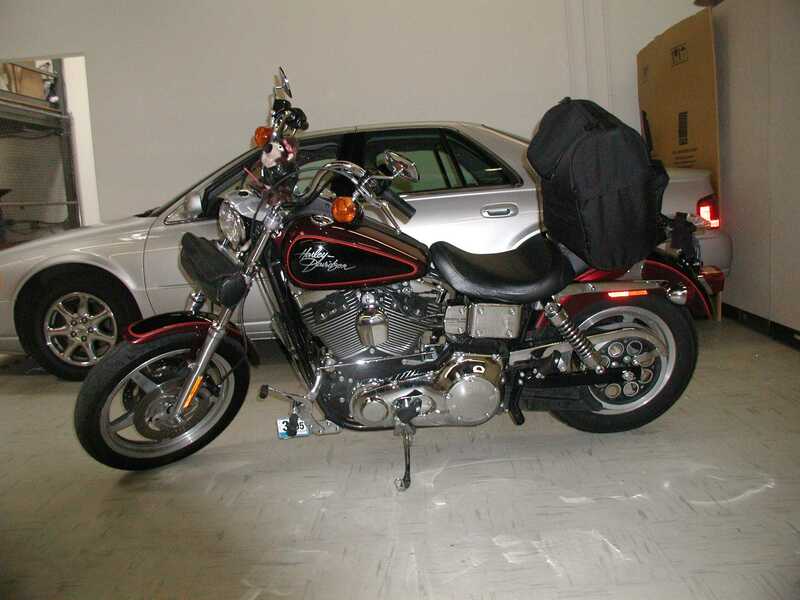 This is my 2000 Harley Davidson FXDL (Dyna Lowrider). Love to ride.. It is hard to choose some weeks.. Jeep, Bike, truck.. Here it is 2004 and I now have my CJ finished and back home.